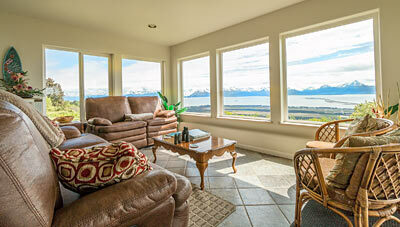 Aloha Alaska Bed and Breakfast is located 3.5 miles from Homer Alaska over looking Kachemak Bay. Enjoy the 10 minute drive up East Hill to our home located on Glacier View court. 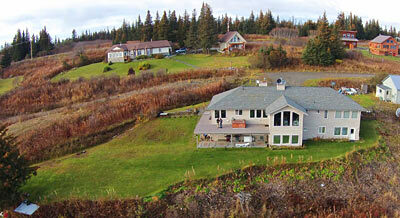 You haven't seen Homer until you've seen it from a birds eye perspective. You'll feel like you're on top of the world. 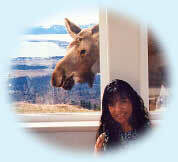 Our home was built with the Bed and Breakfast in mind, eliminating conversions that most B&B's face. We have four large rooms for your comfort and enjoyment. Wake up at your convenience to a hearty self served continental breakfast. Enjoy the comfort of lounging in your robe while sipping a cup of freshly ground coffee from our panoramic living room. There are four Island themed rooms to choose from. The Hawaii & Molokai rooms form a two bedroom apartment suite for larger groups and families. The Maui & Kauai Rooms each have a private bath and King bed with private entrances and spectacular views. It would be our pleasure to help you arrange tours, fishing or recreational activities. Let our local knowledge work for you.